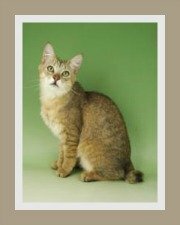 The American Curl Cat is a rare cat breed and as the name implies, it is characterized by curly ears. 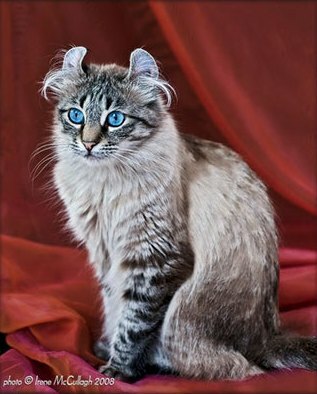 American Curl's ears are what really differentiates this breed from other cats and is caused by a spontaneous mutation. The ears are moderately large, erect, and set high on the skull. The ears curl back towards the top of the head. The cartilage of the ear is firm from the base to at least one third of the height. The degree of the curl ranges from 90 degrees to 180 degrees maximum and should be a smooth curve. The curved ears should not touch the back of the head. 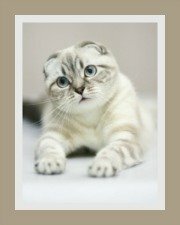 The cartilage in the cat's ears should not be handled except when cleaning them and even then, they should be handled gently and never attempt to bend the ears into a different position as this can damage the cartilage. 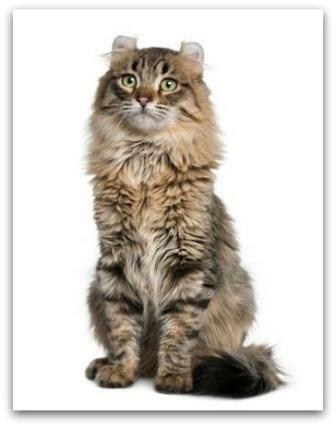 There are two varieties of the American Curl Cat, the semi-longhaired and shorthaired variety. Both coats have very little undercoat which means that they do not tangle or matt. This is the more common variety, displaying fine, silky hair that lies close to the body. The reason they don't matt excessively is that they have a sparse undercoat. The tails presents as a full plume and there is no ruff. The hair is silky-soft, lies close to the body and is dense and plush to the touch. Once again, there is minimal under-coat. The tail coat is the same length as the hair on the body. The Curl has a 'foreign-type' body which means it is a slender cat with a well balanced build. Whilst they are not very muscular, they do have great muscle tone and flexibility. Males are larger than females. Its legs are medium in length, and the tail length is equal to that of the body length. 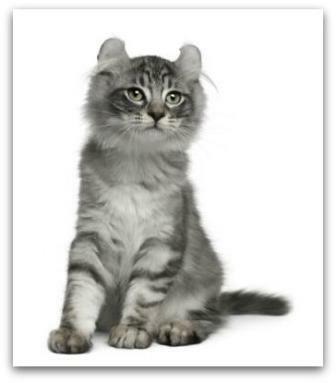 The American Curl cat has a medium sized head, shaped like a wedge which means it is slightly longer than it is wide. The eyes are oval (or walnut) shaped. The eye color should be clear and brilliant and generally has no relation to the coat color - the only exception is for the colorpoints that has blue eyes. The American Curl is not an apartment dweller. It does not like to be confined. It is an active cat that requires some exercise. A safe, enclosed, escape-proof garden would suit it best. 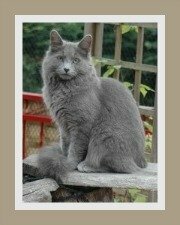 Is this cat suitable for a family or a home with other pets you may ask? Yes. It generally adjusts quickly and easily to children, other pets and new environments. We suggest that younger children be educated on how to handle cats and kittens. All cats prefer gentle handling. The American Curl is a very energetic and playful cat that is affectionate and fun-loving. You will need to watch your precious ornaments when kitty decides its playtime. Owners tend to agree that whilst they are intelligent cats, they do tend to retain kitten-like qualities way into adulthood. The ultimate pleasure for a Curl is a warm lap or a freshly made bed to snuggle into. It is people-orientated and makes a loyal soul-mate to its human owners. Some say that it is dog-like in its attentiveness towards its owner. It will happily follow you around the house and is equally content to watch the game on TV with you. Another trait of the Curl is head butting, which is its way of greeting friends and family and displaying affection. Some American Curl cats are not very vocal, whilst others can be quite talkative - cooing and making trill-like sounds. The good news is it has a soft voice and the only time that you are likely to hear it is at dinner-time, when it eagerly demands food. 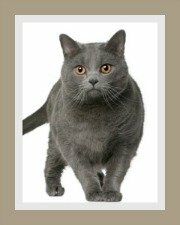 This domestic cat is a medium maintenance cat. Its coat needs to be brushed at least twice a week. 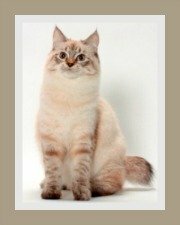 Apart from common infectious feline diseases, for which they can receive cat vaccinations, this is a healthy cat breed. The American Curl needs a well balanced diet. If possible, feed your cat premium cat food. 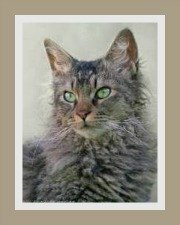 You have a choice of dry kibbles, semi-moist, raw or canned food or a combination of dry and wet cat food. Provide your cat with fresh water daily. Minimize its intake of treats and dairy, especially milk due to lactose intolerance. The American Curl cat has a life expectancy of 12 + years. In this chapter on 'How long do cats live' we elaborate on all the factors that influence a cat's life span.